When it's time to clean the carpet in your home or business, consider the readily available "green" alternatives. Besides the expense of hiring a professional carpet cleaner, the traditional commercial carpet-cleaning solutions may contain a cocktail of hazardous chemicals. Some solutions contain Tetrachloroethylene (perchloroethylene), commonly called "PERC", a noxious dry cleaning additive. According to the U.S. Environmental Protection Agency (EPA), tetrachloroethylene is known to have neurological, liver, and kidney effects following acute (short-term) and chronic (long-term) inhalation exposure. The Agency for Toxic Substances & Disease Registry (ATSDR) discloses that PERC can cause dizziness, headaches, insomnia, fatigue, nausea and death if ingested or inhaled. Others, like Resolve Carpet Cleaner with Teflon, contain propylene glycol methyl ether, which according to the Center for Disease Control and Prevention can cause irritation of the eyes, skin, nose, and throat, as well as headaches, nausea, dizziness, drowsiness, vomiting, and diarrhea. Carpet cleaning ingredients may become airborne when applied during cleaning and also be ingested by children and pets that play on the floor. Additionally, carpet cleaning chemicals pollute local water systems if disposed of improperly. There are some green-friendly cleaning solutions used by professional carpet cleaning services. The plant-based solutions are marketed under the following names: Bi-O-Kleen, Capture, AFM SafeChoice, SimpleGreen and Seventh Generation's Carpet Cleaner. Before you hire a professional carpet cleaner, ask to see the ingredients of any solutions they use. To be sure you get the "green" products they promise, get a written statement to that effect. The good news is that there are some natural and safe ways to clean your carpet yourself. First, thoroughly vacuum the area. If area is still wet, moisten and rest a Shamwow! cloth over any stain for a few minutes. Wring the cloth dry and reapply until all moisture is removed. a) Natural Cleaning Solution for Steam Cleaners. Fill the machine with equal parts white vinegar and warm water. Operate according to the manufacturer's instructions. b) Natural Cleaning Solution for Stains and High Traffic Areas. 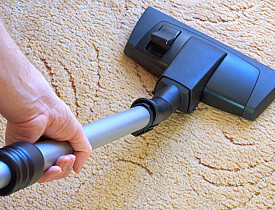 For carpet stains, mix equal parts white vinegar and water in a spray bottle. Spray the stain and let dry for twenty minutes. If needed, rub area with a brush or sponge using warm soapy water. Make the soapy water with homemade soap or other eco-friendly soap. Let dry completely and vacuum. c) Heavy Duty Carpet Cleaner. For an extra heavy duty carpet cleaner, blend these ingredients into a paste: 1/4 cup salt, 1/4 cup borax. and 1/4 cup white vinegar. Rub paste into carpet and leave for at least two hours. Vacuum when dry. Before using any carpet cleaner, test on a small area first. Also, avoid all contact with the eyes and prolonged contact with the skin. Protect your family, pets, or customers, and the environment by choosing eco-friendly, natural carpet cleaning solutions. If you want professional cleaners to do the work, insist they use "green" products. Save more money and DIY! Grow an Avocado...You Know You Want To!